It is quite apparent that Justice C.V. Wigneswaran’s (JW) “perceptions of historical facts”, adumbrated in his letter to Gallege Punyawardana, President of the Sinhale Secretariat, (See full text in attachment, dated: 8/6/2018), is to claim that history is on the side of the Dravidians/Tamils. Claiming history to be on the side of the Dravidians/Tamils has been a fundamental political strategy of the separatists/federalists. More than legal or political arguments they have relied on “perceptions of historical facts”, as stated by JW, to advance their politics of separatism/federalism. The emotional appeal of “perceptions of historical facts” has a greater impact on the psyche of the Tamils than the objective realities of recorded history. In the long-running debate to determine whether history is on anyone’s side it is necessary to sieve the hard realities from the questionable claims and denunciations outlined as “perceptions of historical facts” by JW. It is necessary, in the main, for several reasons. Second, it is the “perceptions of historical facts” – please note, not objective historical facts — tailored by Jaffna-centric politics that gathered momentum and came down to the South from the North like a demonic juggernaut. Like Hanuman’s ever-lengthening tail, it is these “perceptions” that set fire to the whole nation. It is the politically determined “perceptions of historical facts”, outlined by JW in his reply, that informed and directed the course of mono-ethnic extremism, particularly in the post-G. G. Ponnambalam era when communalism took a violent turn after the first Tamil-Sinhalese riots in 1939 in Navalapitiya, provoked by Ponnambalam’s anti-Sinhala-Buddhist attack at a public meeting. Ponnambalam was the first to feed these “perceptions” into the peninsular mind curtained by fragile cadjans. These “perceptions” became a potent force to turn the Sinhala-Buddhists into a bogeyman in the peninsular mind. By and large, tendentious politics derived from an imagined past depend not on the hard realities of objective history but on the “perceptions of historical facts”, as phrased correctly by JW. “Perceptions” are commonly known to be highly subjective. Unlike the objective hard facts of history it is the “perceptions” that are easily exploited for explosive politics. Most perceptions are born out of myths, prejudices and ignorance wrapped in volatile emotions. Perceptions equated as “historical facts” too tend to skip both history and facts and acquire the characteristics of hate-filled myths, prejudices and emotions. Third, apart from JW’s prominent legal career, he represents, in the current political climate of Jaffna, the extreme ideological point of view, breaking away from the so-called moderates in the TULF. Though he defines himself as a “federalist” and not a “separatist”, he has rejected the “federalism” of the TULF and plugs his extreme version of “federalism” which is the equivalent of a separate state. Fourth, his citation of the five “historical facts” confirms that the drift towards mono-ethnic extremism from the 30s was based essentially on their version of history designed to make them look great in their own eyes and that of the world. Their version of history has been to demonize the Sinhala-Buddhists as the evil force that victimized and discriminated against the minority Tamils. The SJVs, the most privileged community in Sri Lanka, has thrived on victimology. They have won the hearts and minds of the global community – and also segments of the Sri Lankan Left and Right wingers – by posing as victims of the evil Sinhala-Buddhists. It is this version that is used to justify their claim for (1) an exclusive territorial enclave based on ethnicity and (2) political power equal to that of a separate state. 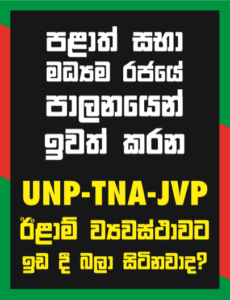 JW repeats this anti-Sinhala-Buddhist version in his letter to Mr. Punyawardana. Fifth, Tamil obsession with their version of history, or “perceptions of historical facts”, as stated by JW, has been one of the primary causes for driving the North incrementally to mono-ethnic extremism which led to their intransigent politics, which led to the exacerbation of the inter-ethnic relations and finally to Vadukoddai Resolution (May 1976) that took them all the way to Nandikadal (May 2009). Consequently, it is impossible to engage in any discourse on the North-South conflict without getting entangled in the multifarious threads of history that inter-meshed with reactive Southern politics. Like the competing political establishments of the North and the South at the top there are two historical narratives at the base battling for supremacy. These two ideological undercurrents can be considered to be the primary bases from which they find the fuel to keep the fires of their respective brands of politics burning. The fuel that keeps the fires the Northern politics burning is found in their irredeemable obsession with their version of history. JW’s letter to Mr. Punyawardana, consisting of his “perceptions of historical facts”, represents the quintessential version of Tamil history. Sixth, JW’s repetitive challenge issued to the Indo-Aryans/ Sinhalese to prove him wrong on his version of Tamil history indicates that he is certain of history taking his side. In his challenges he poses as if he is the final authority on history which can demolish any arguments raised by the Sinhalese. So far there has been no serious response to his challenge. This silence is interpreted as a victory for JW’s version of history. Triumphalist JW continues to throw this challenge and even in his latest letter (8/6/2018) to Mr. Punyawardana he repeats: “If you think you could prove a contrary view of history please let me know. If need be we could get down International Historians her, of course to study and report.” I do not claim to be an international or national historian. I am only qualified to challenge JW based on my journalistic scrutiny of the corrosive politics that has dominated the better part of the 20th century which spilled over to the 21st.I consider my journalistic scrutiny to be the equivalent of academic research which, of course, is open for criticism. On this basis, I am willing accept his challenge to debate the five points listed by him. Hope he will accept for the good of all communities who will be interested in testing the history that is questioned by both sides. Last but not the least, though JW’s letter is in point form it encapsulates a wide spectrum of the “historical facts” on which Northern SJVs depend to advance their brand of federalist/separatist politics. JW should be congratulated for essentializing the main strands of the Jaffna-centric history with which Dravidian/Tamil ideologues describe their cause. It makes it easy to scrutinise the veracity of his “perceptions of historical facts”. Let us, therefore, take one by one and examine how valid the “historical facts” are, as narrated by JW, who is undoubtedly the leading political and intellectual representative of Northern “federalism” / “separatism” in this day and age. His first point says: “The Dravidians (meaning Tamils) lived in Sri Lanka before the Birth of the Buddha.” Let us concede this for the sake of argument, if not for the sake of JW who believes that history is on his side. He raises this as an issue to elevate the status of the Dravidian/Tamils. He obviously believes that because his ancestors “lived” – that is the operative word – before the Birth of Buddha he and his fellow-Tamils have a right to claim territory and power in the areas which he declares to be the exclusive domains of the Dravidian/Tamils. Perhaps, he might go as far as to press the point that the Sinhalese have a lesser right to be in Sri Lanka because the first right goes to the Tamils who came here first. Even if we are to concede his claim of superiority because they came first, how valid is this to determine the rightful place in history of those who came “after” the Tamils? To answer this questions it is necessary begin by asking one simple question: What are the consequences and the significance of the Dravidians/Tamils who “lived” in Sri Lanka before the Birth of Buddha”? If, for instance, they twiddled their thumbs under a palmyrah tree, living off the toddy dripping from its flower, does it really matter to anyone, or to history? They have to justify their existence by the contributions they made to history. So what are the contributions they made to Sri Lanka as the First-comers? There are so many species who “lived” in history. But history recognizes only those who had made a worthy and lasting contributions to history. It doesn’t matter who came first. In the last analysis, the legacy, the power and the glory belongs to those who made history. In any case, JW is not revealing an astounding or unknown historical fact in saying that “(t)he Dravidians (meaning Tamils) lived in Sri Lanka before the Birth of the Buddha.” Even the Mahavamsa, which the SJVs deride, concede that the Nagas, Yakkas, and the Kuvenis clans “lived in Sri Lanka before the Birth of Buddha”. In fact, it states that Buddha came to Sri Lanka settle a dispute between rival clans. So what’s the big deal of the Dravidians/Tamils who “lived” in Sri Lanka before the Birth of Buddha”? It’s spurious argument which has no relevance to the contemporaries who have two different histories totally unrelated to JW’s First-comers. With the geographical proximity, it is possible that the Dravdians / Tamils drifted into the northern shores accidentally, like the way the Portuguese were thrown by the winds and the waves to Galle in 1505. Prof. K. M. de Silva, Sri Lanka’s foremost historian wrote : “The settlement at Pomparippu and a possible one at Kathiraveli in the east of the island (both around 3rd 2nd BC) need to be treated as isolated occurrences, not as evidence of widespread Tamil settlements.” (p.13, A History of Sri Lanka, Vijitha Yapa, 2017). In any case, they had not left any evidence of the type that was going to make history in Sri Lanka. So it is the relevance of some ghosts of the past who had not contributed either to their glory or to the glory of a historical legacy that needs to be answered. Besides, though the Mahavamsa, which mentioned the presence of the “Demalas” on several occasions later in the Dutugemunu-Elara period, it did not refer to Tamils in the pre-Indo-Aryan era? To his credit, it must be noted that historian Bhikku Mahanama, did not fail to note any significant presence or event. How come he referred to “Demala” gigolos in the court of the nymphomaniac, Queen Anula, and not to the Tamils in the pre-Indo-Aryan era? Could it be because they were an irrelevant factor if, in fact, they were the First-comers? It is equally important in dealing with this issue to find out how JW’s “historical fact” of the Tamils coming first had determined the entire course of history which began in the pre-Christian era? Does this “fact” have any impact on the monumental history of the Sinhala-Buddhists? The answer to this could be found in comparing and contrasting the historical developments after the coming of the Indo-Aryans/Sinhalese with that of the Tamil First-comers. The coming of the Indo-Aryans / Sinhalese was the beginning of a new historical era in Sri Lanka. History blossomed into one of the finest cultures and civilizations of the Ancient and Medieval worlds with the coming of the Indo-Aryans whom the Mahavamsa defines as the “Sihalas”. But what was the result of Tamils coming first to Sri Lanka? If they were present in the pre-Indo-Aryan period how did they fade out of historical screen in the post-Viyayan era like the Nagas and Yakkas? However, whenever they surfaced later they were seen only as exploitative intruders, unwanted interventionists, and imperialist invaders who came to destroy what the Sinhala-Buddhists had created and not as constructive or creative enablers of the rising glories of the Sinhala-Buddhist civilization. So in what meaningful way has JW’s “historical fact” raised the Jaffna Tamils to a superior status over the others by coming first? Does coming first give superior rights to the Tamils more than the others who are said to have come later? Except as a historical footnote, how important is their arrival “first” which, if true, had run into a dead-end with no known achievements, either to their glory or to that of the nation? On the contrary, the arrival of the Indo-Aryans/Sinhalese led to the opening up of a vast expanse of history that flowed down the ages, determining the distinct identity and the culture of the island-nation as that of the Sinhala-Buddhists. In the light of historical records, isn’t this claim of having come first totally irrelevant to the acclaimed history acknowledged even by the Tamil historians? JW’ intention in highlighting the Tamils as First-comers is to make a political point in order to manipulate the ranking of the Dravidians/Tamils to a higher status than that of the Sinhalese who, according to his version, came later. He is using this as a “historical fact” to advance his politics of a Tamil entitlement to a separate/federalist state on the grounds that they “lived in Sri Lanka before the Birth of Buddha”. If this is the argument for a separate/federal state then should not the descendants of the Nagas and Yakkas also be entitled to a separate / federal state? Besides, on this argument of the superiority of the Dravidians/Tamils “living” in Sri Lanka before the Sinhalese, shouldn’t he also agree to throw out forthwith all the Indian workers in the estates who came long after the Kandyan peasants, the historical inhabitants of the hill country? There is no problem in acknowledging that diverse religious, linguistic, racial, nomadic groups etc had “lived” in Sri Lanka before and after Buddha. The problem arises ony when JW raises it as a point to emphasize the claims of only the Dravidians/Tamils to a superior place in history and politics, reducing the status of the Indo-Aryans/ Sinhalese and others to a lesser grade. If he is correct, does this mean that the Muslims, Malays, Burghers etc., who came later do not have the rights of the Dravidians/Tamils to share the political space in Sri Lanka in common for the good of all? Does this mean that Velupillai Prabhakaran had the right to ethnically cleanse Jaffna by ordering the Muslims to get out of the peninsula within 48 hours? As stated earlier, there is evidence of non-Indo-Aryans/Sinhalese living in pre-historic times. Practically, in every modern nation there is evidence of the aborigines occupying territory in pre-historic times. The roots of the post-Westphalian modern nations go back to pre-historic times. Take the case of Australia, for instance. Researchers have dated the aboriginal cultures way back to 30-50,000 years. But whose history do the recent Tamil migrants, who are now Australians, recognize? Whose history do the recent Tamil migrants in America, Canada and New Zealand recognize? Do they recognize the history of the First-comers or the Late-comers? Do they even consider the First-comers to be superior to the Late-comers? Do they consider the First-comers who have been marginalized and virtually confined to semi-concentration camps even to this day, to be the makers of history in these nations? Are the new Tamil settlers in these countries and in Sri Lanka the beneficiaries of the history made by the First-comers or the Late-comers? As stated earlier, the operative word in JW’s claim is “lived”. Again, as stated earlier, there were diverse categories of beings that “lived” in Sri Lanka, including ants, plants, marsupials, etc., etc. But the living legatees in the political space of the 21st century owe everything to those made history and made the land habitable to enjoy the labours of the hard-working pioneers who made history. All human beings live in history – history made by their forefathers. Only the irrational mytho-maniacs would deny this historical reality. History is a vast open field in which teams of various grades play against each other. Invariably, tensions and conflicts arise when B and C graders pretend to be superior to the A team and make outrageous claims to divisive power and territory. History is one huge chapter which states unequivocally that history and its legacy belong to those who made history with their blood, sweat and tears and not to those who noisily claim that it is theirs, after everything has been made for them to harvest the fruits of the seeds planted by the pioneering founding fathers. So it is not those who came first that matters. In any nation it is those who made history that matters. JW and his fellow-travelers are not enjoying the fruits of the Tamils who came first but the Sinhalese who came later and made everything possible for him to sit in the bench of a Supreme Court judge first, and now as the Chief Minister of Jaffna. He is most welcome to bring his “International Historians”, and even national historians, to defend his case, if he agrees to a debate. Considering all these historical facts what is the worth of the boast of JW that “the Dravidians lived in Sri Lanka before the Birth of Buddha”? What does it prove? To argue that the date of arrival gives precedence, or superior significance, or greater importance, or the right to claim power and territory exclusively for the First-comers, is against the accepted norms of moral and political principles. All citizens who came before Buddha or after him have equal rights to share the land in common. Of course, it is obvious that he wants to claim superiority of the Tamils over the Sinhalese by proclaiming that the Tamils came before the Sinhalese to push his political agenda. But what he fails to realize is that this claim actually indicts the Tamils instead of giving them a superior place in history. Hiding behind an argument that they are superior because they came first leaves the Tamils and the rest of the world neither here nor there. What matters in evaluating history is not the time of arrival but what was achieved in the time after arrival. For instance, there are those who came and did nothing. There are also those who came before and after and did everything to create a brand new civilization. Of the two which one would be recognized as the supreme contributors to the making of history? As admitted earlier, there are many who came earlier than the Sinhalese. But of all the migrants only the Sinhalese made history. Unique and glorious history! So can the Tamils be proud of coming earlier than anyone else and doing sweet nothing, either to their glory or that of the nation? Shouldn’t they be ashamed that they came early and turned into Koombakaranayas, or Rip Van Winkles, doing nothing? What I have written is only a fragment of the totality of my arguments needed to debunk JW’s five points. Besides, of the five points I have dealt only with his first point. I reserve the right to deal with his other points in the proposed debate. The issues raised by him can be debated in detail, if not exhaustively, if there is time, in a public debate. May I request, therefore, for him to accept this challenge and debate the listed five points at a mutually acceptable place and time in Sri Lanka. I live in Melbourne and I’m prepared to fly out and meet him if he is willing to accept my challenge. I hope he will accept it because he has to convince his Tamil following that he is their hero who can defend their claims. One more point: If he feels the need to bring images of his Swamy, who had raped and killed innocent Tamils girls, for any moral support or inspiration, I have no objections.